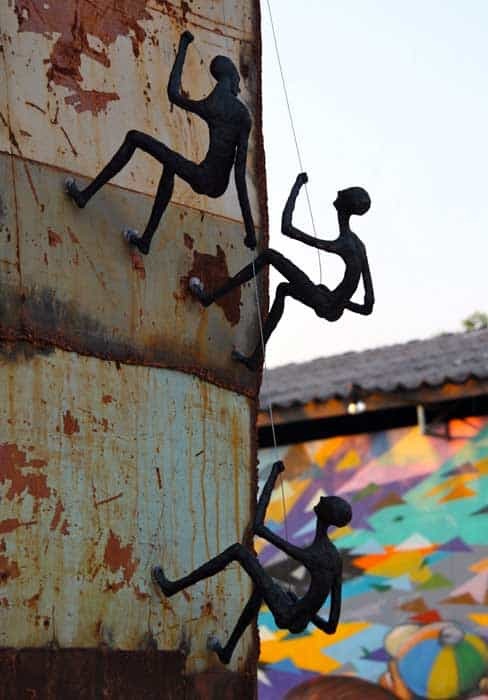 Our unique climber sculptures are the perfect example of the creativity and originality of thai art and metal wall art. 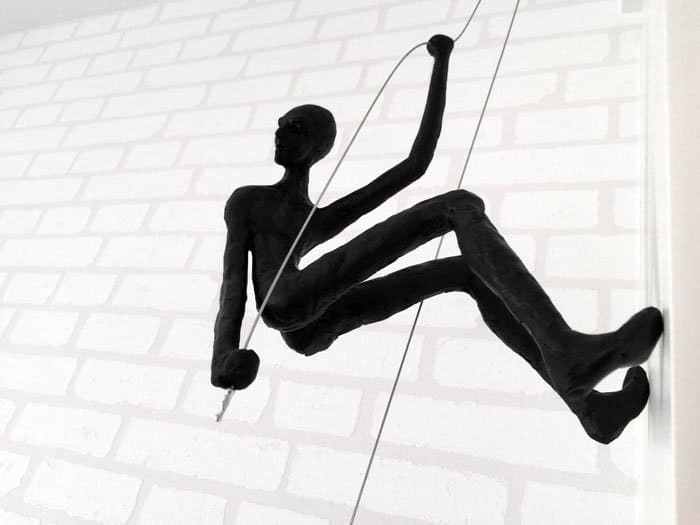 One of our most popular items, the Climbing Man by Nop is beloved for its simple yet eye-catching art design. Moreover, the manageable sizes of our climbers mean that they work beautifully in any interior or exterior space. 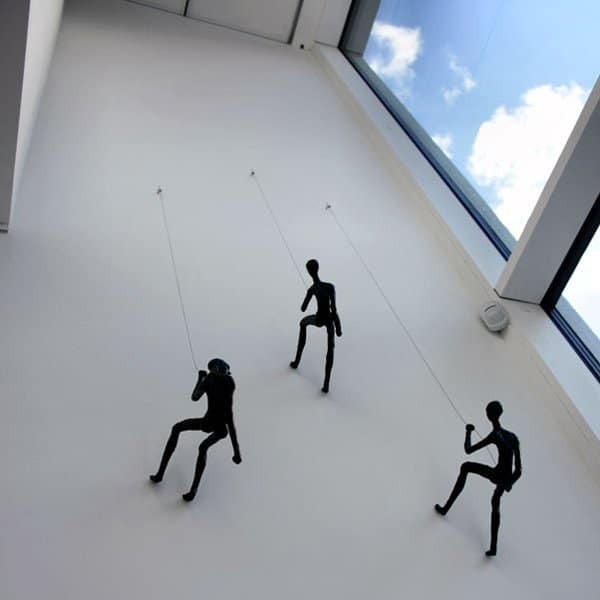 The Climbing Men are made of resin covering a steel framework attached to a steel rope, and are available in a number of customisable lengths. They offer a tongue-in-cheek representation of humankind’s desire to move up and forward into prosperity and success. The climbers not only provide us with an engaging, positive message but also are light-hearted and fill any space with a sense of fun. 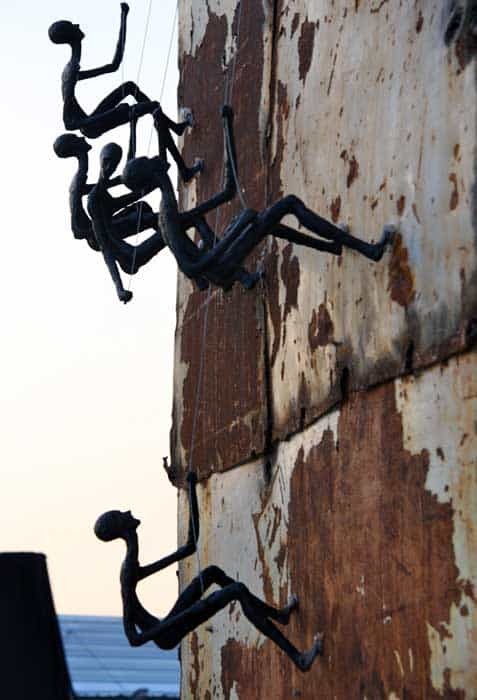 The climbers are fascinating resin sculptures that act as a conversation starter and deliver joy to all ages. Every order includes express worldwide shipping with insurance, free custom ropes and extra spare ropes (on demand). You'll get everything you need to easily install your climbing man wall sculpture at home or in your office. The sky-facing sculpture “A” (position A) and the downward sculpture “B” (position B). Look at photos just bellow to see the difference. 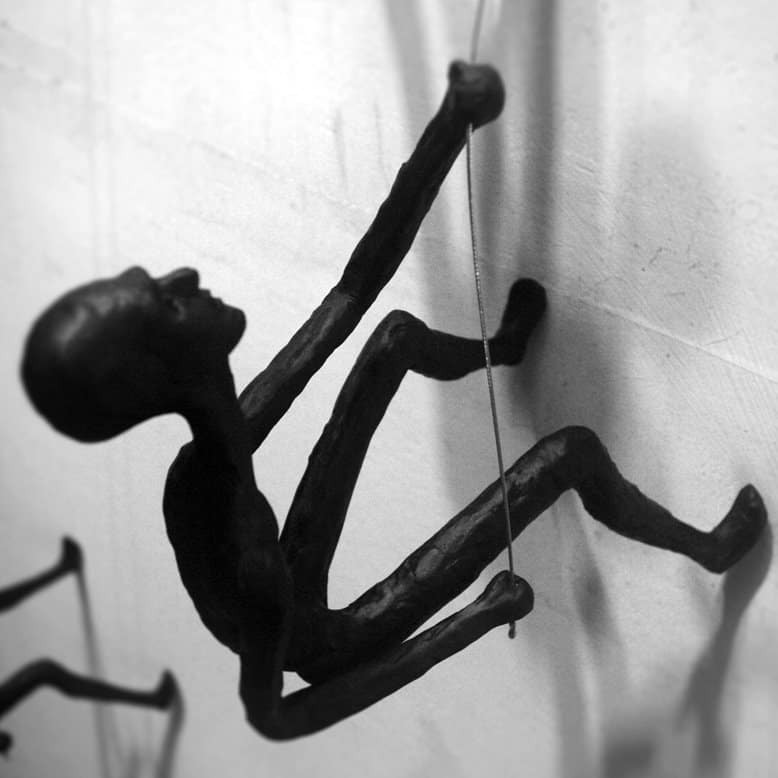 The Climbing Man Wall Sculptures are approximately 20.5 centimeters (7.8 inches) in height. For the width of the Climbing Man, we measure the distance between its widest points, which are the splayed stances of the feet. The space from foot to foot is approximately 20 centimeters (7.8 inches). Finally, for the depth, we measure as the distance from the feet to the top of the sculpture – or the head of the man. 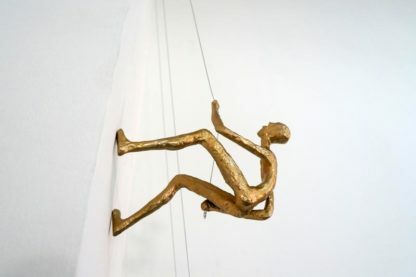 The depth of the climbing men wall sculptures averages at around 26 centimeters (10 inches). 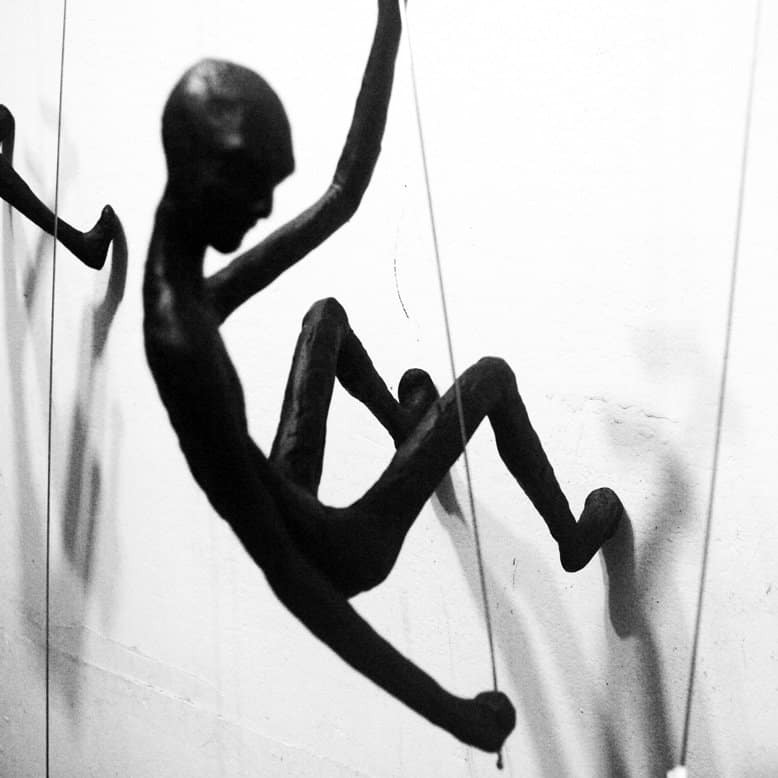 Each individual resin climbing man weighs about 700 grams or 1.5 pounds. Why makes the Climbers an ideal gift? 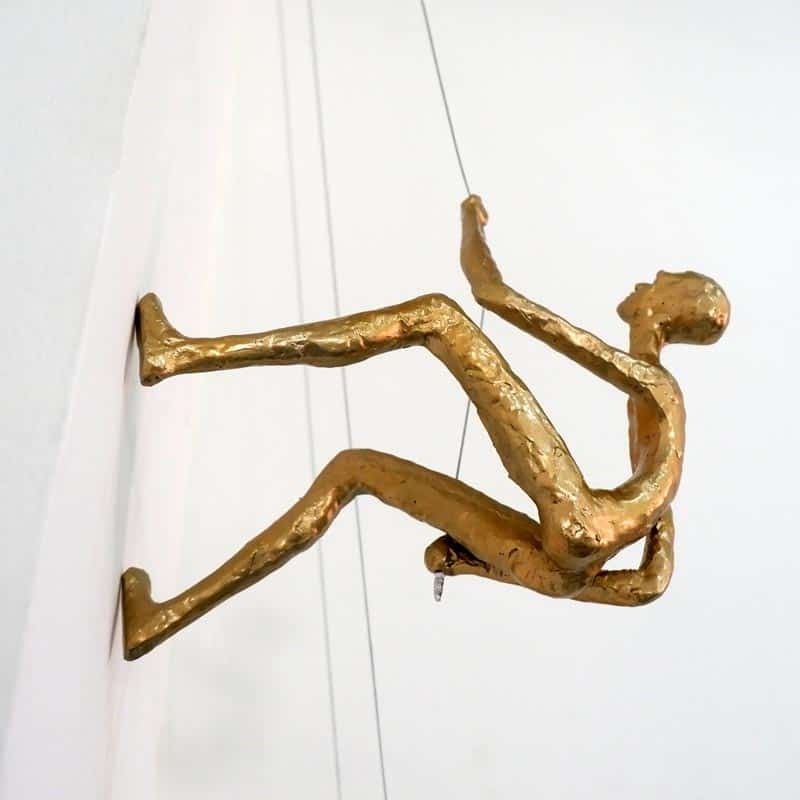 The Climbing Man Wall Sculptures are the ideal combination of Thai style, affordable art, and easy-to-love art. Not only are they suitable for friends, colleagues, and loved ones, but they are extremely easy to integrate into any interior or outdoor space. 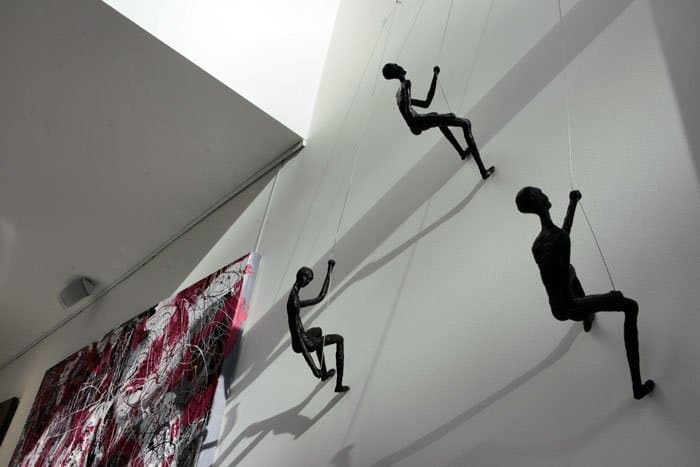 Our resin climbers look great with just about any other item of artwork you may already own. Sculptures are often the most noticeable items in a home, and the Climbing sculptures are a wonderfully abstract yet universally loved item that adds a touch of culture to any space. The Climbers act as a highly positive symbol, making us think of teamwork, reaching your full potential and vertical movement. The Climbers are particularly suitable items to hang in a lobby or an office/workspace – especially for its connotations of excellence. According to many scientific studies, there is a huge correlation between artwork in public spaces such as offices, hospital rooms, and hotels, and its effect on a positive mood. The Climbers are an example of artwork that can give any establishment a positive image while providing a good cultural investment and individuality. Moreover, wall art is an unbelievably easy type of artwork to install in your home. Unlike paintings, which require surroundings that share a similar color palette to look suitable, wall sculptures look good in any space. They don’t take up too much valuable wall real estate and provide a huge impact for a fraction of the cost. In our experience, a large important wall (office, restaurant or hotel) can feature a minimum of 25 sculptures and provides an incredible impression on visitors and dwellers. Bigger houses, on the other hand, can comfortable display 10 – 15 sculptures without giving a sense of crowding. Frequently Asked Questions our support receive on pre-sales and after-sales. Do not hesitate if you have different ones. Each climber comes attached to a steel rope that allows for easy assembling. The durability of the provided steel ropes is very high, being able to withstand sun and rain. They can also be used on any type of wall material, as they are stable and light in weight. The steel ropes of the climbers come in five standard lengths: 80, 100, 120, 140 and 160 centimeters (31, 39, 47, 55 and 63 inches). We can also provide customized rope lengths ranging from 80 to 200 centimeters upon request (31 to 79 inches). Thanks to the variety of available lengths, you can decide how to hang your sculptures anyway you desire. Popular options are either vertically and closely grouped together or widely spaced out, and at the same level. For more information about the recommended positioning of your sculptures, see our section: Composition. Can the Climbers be installed outdoors? A varnish is a thin protective layer of transparent, colorless acrylic that can make an artwork resistant to the elements, including high temperatures, humidity, and dust particles. An example of this is “Krylon”, a clear sealer that protects items with a decorative finish while adding outdoor durability and a tough satin finish. Ideal for plastic, paper mache, ceramic, and more, this item is easy to find at any hardware/appliance or specialty art store. 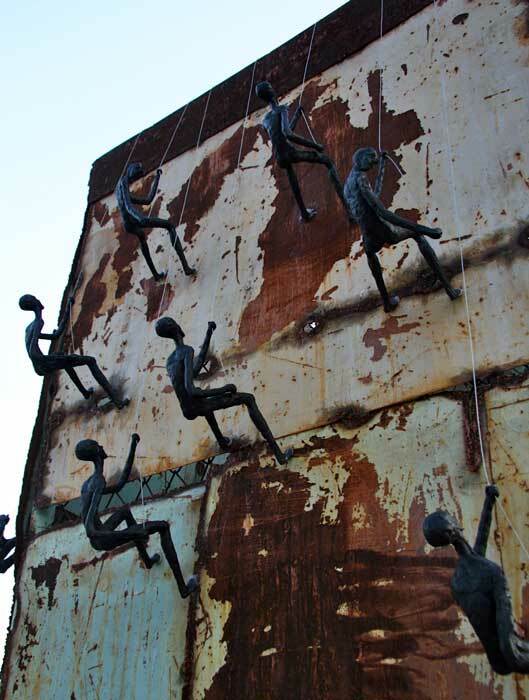 Climbers sculptures on a wall, outdoor – see the photos just bellow. 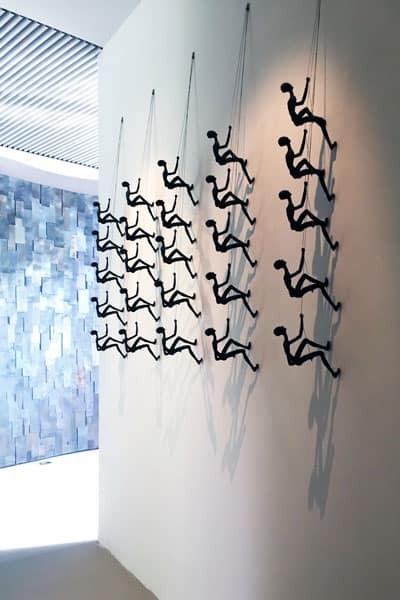 Can you recommend how to compose the Climber sculptures? We’d be more than happy to give you advice on how to install your Climbers based on your unique wall dimensions. Just send us an email with photos and measurements of the walls you’d like to display the climbers on and we’ll get back to you within 24 hours. Our international team can answer you in Thai, English and French. 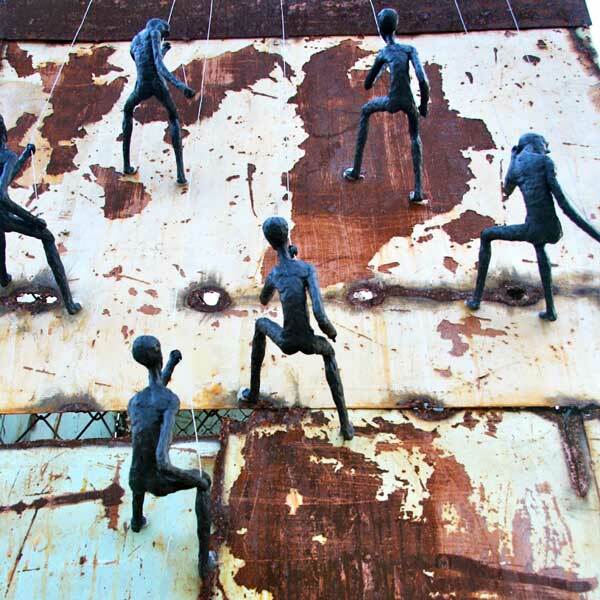 How to choose Climbing Man Wall Sculpture versions? In order to specify which Climbing Man version you want (either facing up or facing down), please state how many of each style you would like in the comment field of your order. You can also email us your order and tell us how many of each style you’d like. Don’t forget to copy and paste your order reference number (e.g. #8899) in the email, so we can be sure it’s you. Even if you do forget to specify this information in your order or email, our team will contact you to double check on your preference. 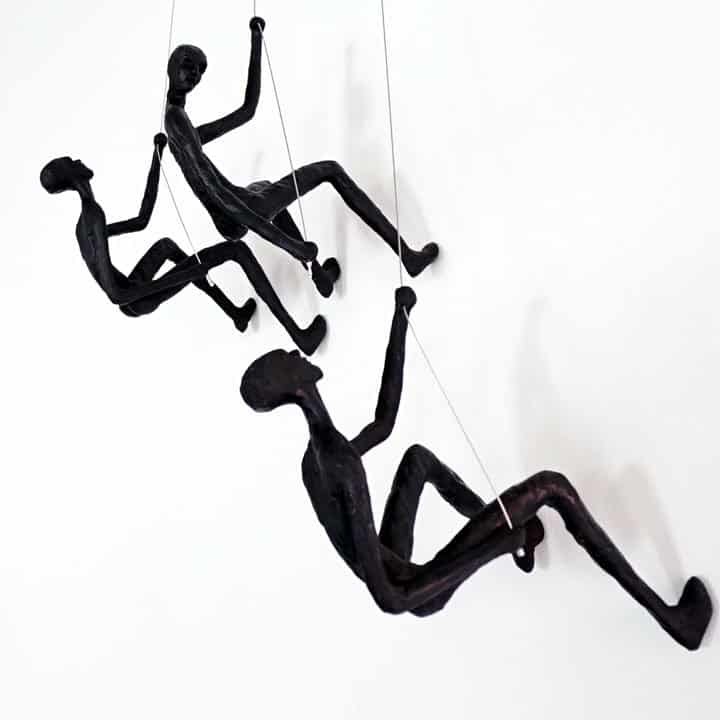 For a set of three Climbers, we usually recommend two upward facing versions and one downward facing sculpture. For a set of 5, we advise two downward facing positions and three upward facing Climbers. You can also order a bigger set of climbers, and choose either all facing up or downwards. The possibilities are endless! 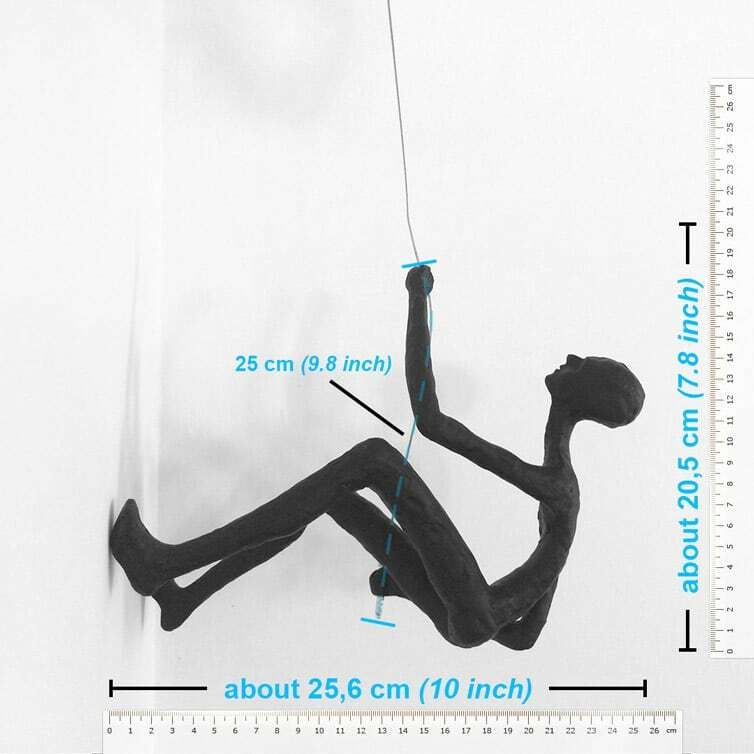 How to choose the rope size of the Climbing Man Sculptures? You can specify the desired rope length the same way you specify the Climbers version, at no additional cost. Just drop us a quick line by email or in the comments section. You can choose from any of our standard sizes, ranging from 80, 100, 120, 140 and 160 centimeters (31, 39, 47, 55 and 63 inches). We also deliver customized rope lengths ranging from 80 to 200 centimeters, upon request (31 to 79 inches). Can I get spare ropes for my wall sculptures? Yes, we can send you a double set of steel ropes for free. Let us know by email or in comment field which size you would like, and we’ll include it your shipment free of charge. We suggest you to look at this video to see how easy it is to change your rope. Which shipping company does Onarto use? We work primarily with our favorite shipping company, TNT. However, sometimes we also use DHL or UPS depending on the country of destination and customer preference. As we are also an art shipping company – focused on custom art documentation and art packaging – we have experience shipping art to overseas artists and art fairs in Asia. What will I find inside the package? Upon opening your package, you’ll notice that each climber has been specially packed with its own bubble-wrap protection. This ensures your sculptures will remain intact and undamaged during shipment. This tightly packed protection guarantees an enhanced and reinforced packaging well suited to the resin material of the sculptures. Next, you’ll see that there will be a steel rope directly attached to each climber. Before deciding on where to place your sculpture, you’ll see that each rope is labeled with a sticker stating the length of the rope. There will also be either an “A” or “B” on the sticker label. This will signify the direction the climber is facing – either upward or downward. This makes installation a piece of cake! Lastly, you can find a business card of Onarto Art included your package. We believe that we are a pioneering online art gallery in Asia, focused on Asian culture and contemporary art. Our goal is to connect you with the hundreds of Thai artists and international and Asian artists living in Southeast Asia. How to install the climbers on the wall ? First off, we recommend you measure the selected wall to have a good idea of the dimensions of the space you are working with. After completing this step, decide where the climbers will go by making dots on the wall with a pencil or marker. These will serve as markers for where you will be drilling or hammering the nails. Next step? Make sure you have securely attacked the nails before hanging the wire rope. You can do this by gently tugging at the nail to make sure it doesn’t move. 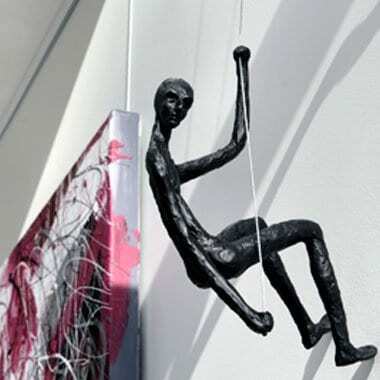 Finally, hang the ropes and take a step back and enjoy your brand new sculptures! How do I make an order online? Will my online payment be secure? Onarto accepts PayPal – the most secure online payment method in the world – for all of our artworks for sale. PayPal offers supreme credit card security as it keeps your credit card information completely private – it also the leader in online purchasing flexibility and freedom. Last of all, it’s completely free to use. If you aren’t a PayPal member, we also take other forms of payment. You can pay online via Paypal with your debit or credit card, even if you don’t have a PayPal account. We accept Visa, Mastercard, American Express and Discover. We also accept direct bank transfers. For bank transfers, please make your payment directly into our Onarto bank account and use your Order ID as the payment reference. Please note your order will not be shipped until the funds have been confirmed in our account. In the unlikely event of damaged goods, we’ll need your help in gathering photos of the packaging, bubble wrap, and sculptures. Upon receiving this information, we’ll be able to reship your replacement climber in a timely manner at no extra cost. First things first, please take note of the exterior condition of your shipment box when you receive the item. If there is any damage, take detailed photos of the container’s exterior condition and send them to us. After opening the box, check to make sure the bubble wrap and packaging is intact. If you believe the packaging is poor, take photos for our reference. Lastly, send us detailed photos of each damaged climber. With all this information, we can then move on to reporting the damage and claiming the exchange. Does the shipping insurance work for every country? Yes, our insurance covers countries across the globe. Just this month we have shipped items to Denmark, Kuwait, Turkey, and all across the United States, in a record time of 4 days – door to door. The speed of your delivery will depend on the transporter and each country’s particular customs and import rules. Nevertheless, we guarantee to accelerate the process to the best of our ability by providing clear and detailed documents. Generally, we say delivery time is between 4 to 7 days maximum. Some destinations will be much quicker to ship to than others. For example, Bangkok to Los Angeles or New York requires a much shorter shipping time than Bangkok to Paris. Do you provide a tracking number for the package? Yes. You can easily follow the status of your shipment with the automatically generated link to your tracking number. If you still have more questions or comments for us, please don’t hesitate to get in touch through email or leaving a comment below. Our multinational team of Thai, English and French speakers can get back to you in 24 hours. Amazingly professional customer service. Questions replied in no time. Delivery without any hassle. Great. Climbing Men mounted. 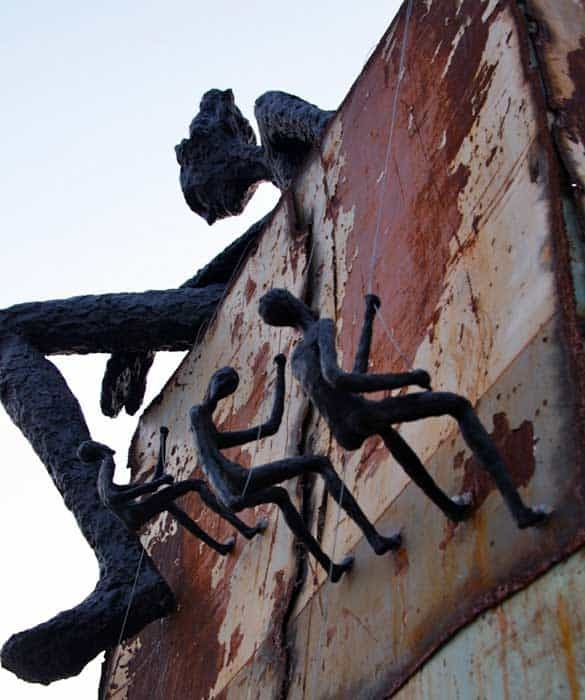 Very unique, cool sculptures that have transformed the space they now climb. Efficient email communication and incredibly quick international postage to New Zealand. We are very pleased with our 3 climbers. Thanks Ben. I thoroughly recommend. Hello, when I inquired about purchasing climbers back in 2014 I was told they were metal/bronze cast. Has the material changed since then? I prefer the feel/weight of metal. Also, is the price above for a set of three? The customer service has been excellent and reliable all the way through, and the delivery to Denmark was very fast. The whole process and the products has exceeded my expectations. Thanks a lot! Very pleased with the product and service. Ben was very responsive, helped us with the design (we bought a dozen of them), the packaged arrived from the other side of the globe in about 4 days, and it was exactly as advertised and very well made. We highly recommend Ben and Onarto. We could be happier with this purchase and with the company. Can you please give me the both dimensions. I understand that the height is 14 inches, but how deep (from the wall or feet to back of head) is each climbing man? We got hold of a set of 9 climbing men. Ther are really unique and they have an expression that you cannot find anywhere else. These are so special and I recieved outstanding service while ordering. These nine men are now in Denmark and they get a lot of attention from guests. Absolutely womderful. how big is each climber? and can one order a single string with multiple climbers on it? How many do we get under the stated price ? How many come in a set for $141? I bought a climber in Hong Kong and now I wish I either had a matching one that looks up or a female version. The female version would be my preference. Is there a chance you will sculpt one? I live in Min Buri so would love to show you the one I have. I just received the eight climbers. They look great. The service during the order process was outstanding and the delivery was perfectly on time. Thank you so much. 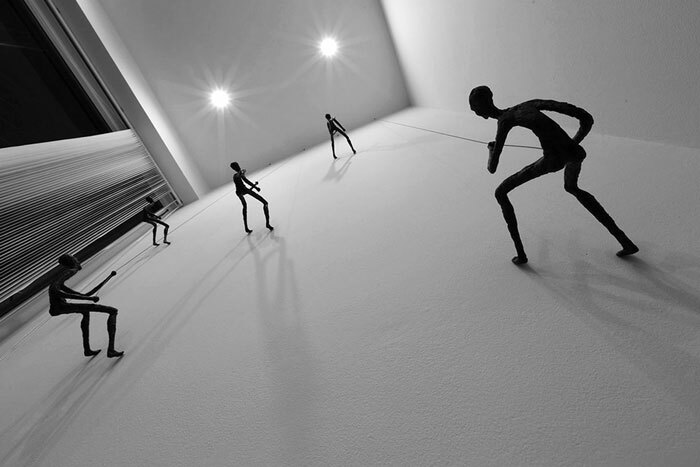 What a fantastic piece of conceptual art work these climbers are! I saw them and just knew that they would fit my loft space very well. The idea of these climbers is very meaningful and inspiring to me. They just have such a cool look against different textured walls. I fell in love with the design. When I ordered, they arrived very quickly and the service was great. They were well packaged when they got to me, and as I took each piece out of the box, I was impressed with the quality. I spent a lot of time deliberating how to arrange them, but ultimately, thanks to the straightforward instructions, I was able to get them up quickly once I decided. They look even better than I expected in person. The design is impeccable. The way they look from every angle, the awesome shadows that they cast upon the wall, and the steel ropes that are attached to each of the climbers. I love this artist and his pieces. This sculptural piece is so cool and visually stunning to look at.It came with a certificate of authenticity too!